As the consequences of Thursday’s referendum result continue to reverberate across the UK, we look at what the indyref tells us about political engagement and public policy in 2014. The indyref voter turnout of 84.5% was a record high. And this was based on over 97% of the eligible population registering to vote. This contrasts with turnout at other referenda, general elections and particularly local government and European parliamentary elections. Turnout for the Scottish parliamentary elections of 2011 was just 50.4%. In the UK, in the 2010 general election it was 65.1%. The Scottish devolution referendum in 1997 (which provided the yes vote which created the Scottish parliament) had a turnout of 60.4%; the Welsh devolution referendum the same year had a turnout of 50.1%. At local level, turnout is even lower. The 2012 Scottish local elections had a turnout of 39.1%; the turnout for the English local and mayoral elections in May 2014 was estimated to be around 35.3% (with the 2014 European Parliament election being held on the same day). New initiatives such as the 41 Police and Crime Commissioners (PCCs) elected across England and Wales in November 2012 have failed to engage public interest, at least at the ballot box. Turnout was below 20% in most areas – with an average turnout of 15.1%. This despite the fact that the PCCs are responsible for a combined budget of £8bn, and were set up specifically to hold Chief Constables and police forces to account to communities. Many people have said that they cast a vote in the indyref ‘because they felt it would mean something’ and it was to be expected that more people would vote in a referendum with significant implications and a clearly discernible difference between the two sides. But it’s quite depressing that in elections for political administrations which control the delivery of local services, the perception of representation and accountability seems to have been lost. The question for political parties, public servants and policymakers is how to communicate about policy choices in a transparent and accessible way, and embed public engagement in day-to-day processes. And that is more difficult to do than when its about campaigning for support for a Yes/No vote on one question. For the indyref, 16 and 17 year olds had the vote extended to them for the first time. Many campaigners, on both sides of the indyref debate, claimed that voters should consider the potential impact of the decision on future generations. Across Scotland, there were 109,533 people on the young voters’ register, according to official figures issued on 19 September. This represents just under 90% of 16 and 17-year-olds estimated to be eligible. Issues that were reported of high interest to young voters included tuition fees, but perhaps surprisingly also welfare and pensions. The Electoral Reform Society has pointed out that young people receive citizenship education at school but face a delay before they can put their knowledge about democracy and rights into practice. The 2006 Power Inquiry emphasised the need to include young people in the political process as early as possible in order to create a basis for greater political engagement in later life. The question about voting age often hinges on the argument that younger people are not mature enough to think through voting decisions. Engagement in schools during the indyref suggests that this isn’t the case. Campaigners also thought it important due to the perceived potential impact of differences in voting choices by age. This research suggests older people would be more likely to vote No – and the Ashcroft Poll of 3000 people on the night of the referendum showed nearly three quarters (73%) of those aged 65 or over voted No. Perhaps the indyref can set the precedent for lowering the voting age … with the next reform being votes for prisoners? With an office in the centre of Glasgow, we experienced first-hand the very visible campaigning from grass-roots supporters. You may have also noticed that, although we’re focused on knowledge sharing of public and social policy, we didn’t blog on the referendum – there being good, balanced sources already out there such as the ESRC’s Future of Scotland and the UK site. It’s been clear that there’s been huge interest in the indyref. According to research from the University of Strathclyde, the referendum inspired more than 10m ‘interactions’ on Facebook over a five week period – one of the highest levels of activity that the monitoring company had ever recorded. These types of interactions include comments, campaign group activity and sharing videos and images relating to the referendum. Although there is the potential for engagement with the referendum to translate into ongoing engagement in local politics or with public policy, there’s probably a larger risk of disillusionment. How will organisations and grassroot movements calling for change sustain momentum after the No decision? There was a lot of angst, as the referendum date grew closer and the polls tighter, about the fact that just a one vote majority would be enough to win. Within our first-past-the post electoral system, sometimes described as ‘winner takes all’, it is often the case that the governing party or parties do not have a mandate from the majority of the population. In fact, at UK (Westminster) parliamentary level, no single party after WW2 has won over half the popular vote. The binary nature of the indyref increased the proportion of voters on the losing side – though conversely, a greater number of options would reduce the mandate of the winning option. 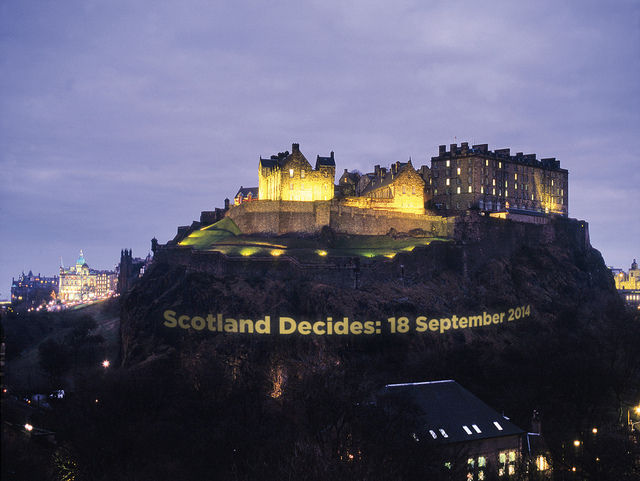 The No campaign might argue that part of democracy is accepting the will of the majority – including at UK level. The Yes campaign alleged that UK politics and governance has systematically failed to respond to the needs of the Scottish people, although we would highlight the fact that people’s needs are rarely homogenous across Scotland, the UK or indeed in any locality. For any undecided voter, the big decision in the indyref was who to believe. Our team of researchers here at the Knowledge Exchange were sourcing material every day purporting to be ‘evidence- based’ and it was a good reminder that research is rarely impartial. From the design or framing of research questions, to the interpretation put on results, there are numerous opportunities for bias to be introduced. How findings were reported in the media was also a big issue throughout the indyref. This was exemplified by differing forecasts of the economic strength of an independent Scotland, reflecting different assumptions about key factors such as the future price of oil and the extent of accessible reserves, the transfer of a share of UK debt to Scotland and trends in business investment. One downside of the No vote is that we’ll be deprived of seeing who was proved right! Society is sometimes characterised as politically apathetic, but the Scottish referendum emphatically refutes that. A simplistic assumption is that people are fed up with politicians and the increasingly similar manifestos of mainstream political parties. A more nuanced conclusion is that campaign-based politics, which encourages people to express their support for a cause or issue, and then allows them to become as active or inactive as they prefer, is a more natural fit to the networked and fractured manner in which people increasingly communicate both at work and in their personal lives. Indyref witnessed a proliferation of grass-roots groups, particularly among those favouring independence, often organised through social media, for example the Facebook group Scottish Pensioners for Independence. Or the contrasting women together and women for independence networks. The challenge for governments across advanced democracies is how to develop and deploy the interactive tools, digital knowledge and responsive legislative and civic processes needed to tap into informal, fragmented and often transient group activity, while avoiding the danger of only listening to those who network the loudest. This entry was posted in Government and politics and tagged #scotdecides, consequences, democracy, engagement, government, impact, independence, indyref, politics, referendum, result, Scotland, scottish independence, turnout, voting. Bookmark the permalink. ← World Alzheimer’s Day: can we reduce dementia risk?